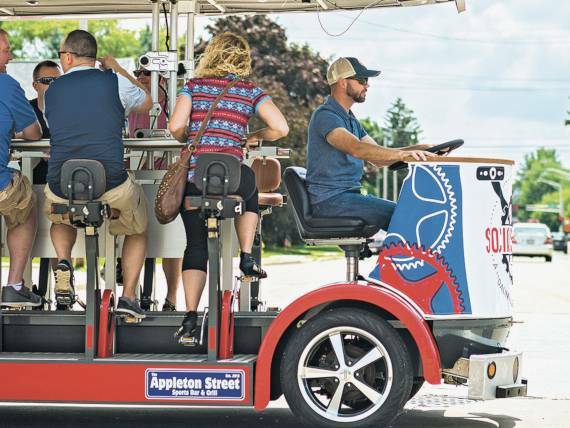 Cruise downtown Appleton in a 15-person four-wheeled Mega Cycle. Pedal around with your friends and a great beer. 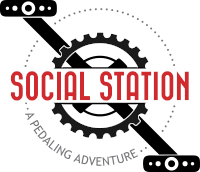 The Social Station is a great option for team building, parties, pub crawls, and anyone looking for a great time! Looking for something to do? 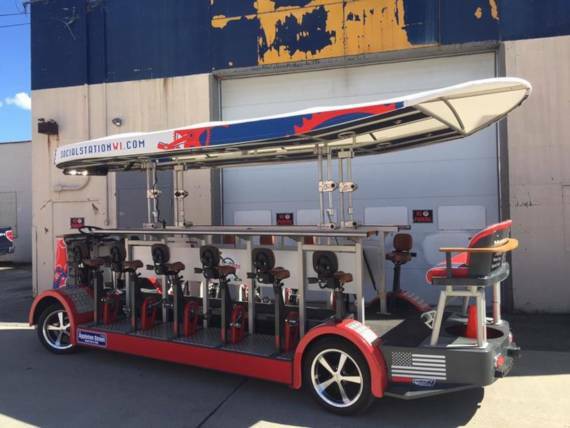 Take a pedal tour through downtown Appleton on this unique 15-seat Mega Cycle. Enjoy a leisurely ride with a beer in hand, while pedaling, listening to music and sight seeing with friends. 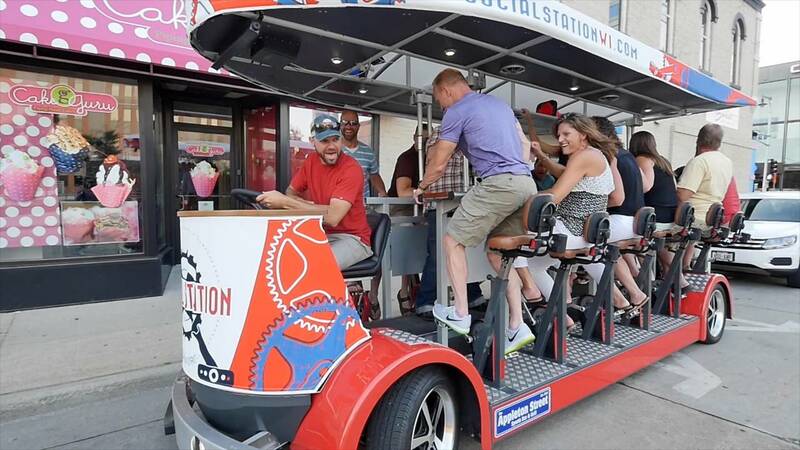 The Social Station is a 15-person bicycle but with 10 pedal station and four wheels. It is the most fun you can have on four wheels in downtown Appleton! We’re just a group of young people who enjoy being outside, we like to socialize and have fun. We love our city and like showing it off. More importantly, we take pride in making your average night out one you wont forget. Choose one of our 2-hour tour themes and cruise the streets of Appleton with your friends, family, office staff, or bridal party. Party planning isn’t always easy. If you’re looking for the perfect party, book your event with The Social Station. Our unique experience provides exercise, entertainment, camaraderie and sight seeing all in one place. Whether you’re celebrating an upcoming wedding, team building event or family reunion, it’s fun and easy for everyone. Pub crawl without the crawling! There is no shortage of bars and pubs in downtown Appleton. Take a tour with us, bring your own beer, and we’ll stop at a few of the hottest bars and pubs along the tour. If you’re lucky, there may be a couple of drink specials along the way. Bring your favorite beer and pedal the beautiful city of Appleton with friends. Discover some of the many hidden gems in our historic city through one of our themed tours. We take our customers to only the best pubs, restaurants, parks, galleries, museums and the many other amenities Downtown has to offer. ...and these are just the beginning. What a great experience. Such a fun way to have a 21st Birthday Party. The Social Station went above and beyond in making sure we were all happy and having a fun time. I know this Peddle Bike is going to go over BIG! Everyone is still talking about how much fun the bachelorette bike night was! Chris and Mark were the perfect hosts for our evening! We couldn't believe how quickly it went. We will be reminiscing about the experience for years to come. After posting pictures, I've had several friends say, "looks like you had a blast! We should book an excursion!" Of course, I said I'd be happy to attend!! The Social Station was a ton of fun for everyone in our party. Chris made sure that the event was catered to our group. The people of downtown Appleton had fun watching us as well! Highly recommended!